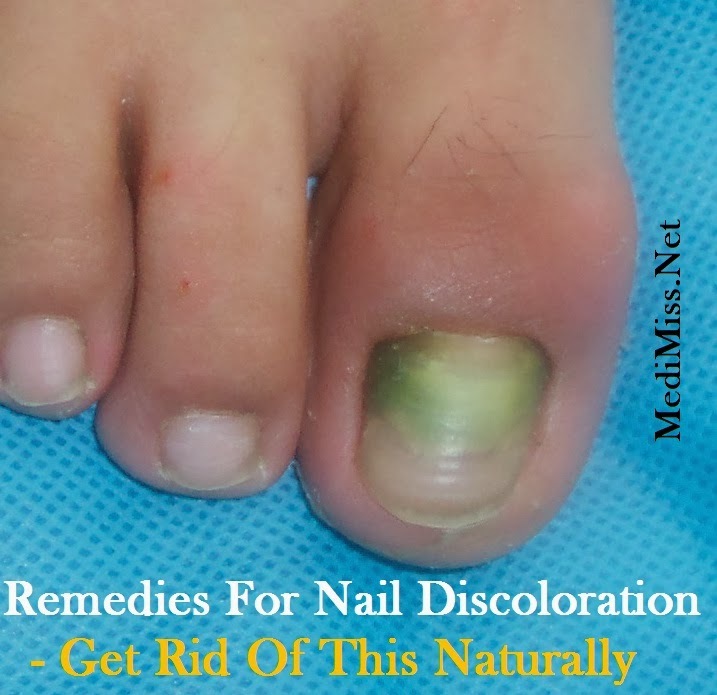 Nail discoloration refers to the changes in the natural color of the nails. Normal healthy nails are usually strong, even, and pink in color. Your nails can become yellow, greenish, or stained due to a variety of reasons. The discoloration of the fingernails and toenails is mostly caused by the fungal infection. Conditions like pseudomonas bacterial nail infection, ingrown nail, yellow nail syndrome, and psoriasis, an autoimmune disease, can also result in nail discoloration. Frequent applying of nail polish is another cause that may lead to the yellowing of the nails. 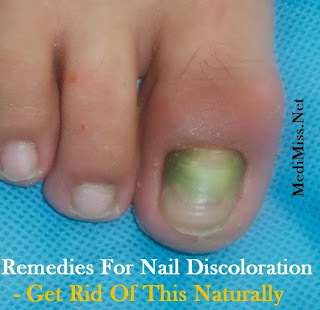 Sometimes, nail discoloration can be a sign of nutritional deficiency or an underlying medical problem. There is no doubt that long, strong, and perfectly healthy nails can make your hands and feet more beautiful and striking. They are also a sign of good hygiene and healthy body. If your nails are discolored or stained, use some home remedies to get rid of discolored or stained nails In order to prevent further discoloration, apply a base coat before using the nail polish. It is also better to avoid dark-colored nails polishes. Lemon juice, a natural bleaching agent and stain remover, is an excellent remedy for this problem. Put enough lemon juice in a bowl to completely cover your fingernails or toenails. Immerse your nails in the lemon juice for about ten to fifteen minutes. You should do this once a day until the discoloration is completely removed. Another way to use lemon juice is to directly apply it to the affected nails using a cotton ball. Make a mixture of one tablespoon of baking soda and one tablespoon of lemon juice and rub it on your fingernails or toenails. Wash your hands followed by moisturizer. One of the other effective home remedies for nail discoloration is to combine a tablespoon of 3% hydrogen peroxide with three tablespoons of baking soda and put this paste mixture on your discolored nails and under the tips. Let it sit there for five minutes and then clean your hands with water. Otherwise, apply hydrogen peroxide directly to your nails with a cotton ball. Denture tablets can be used to eliminate yellow discoloration from the fingernails. Melt one or two denture tablets in a basin of water and put your fingernails into the water for at least ten minutes. Softly buffing your nails with a nail buffer or emery board is also an effectual method to get your nails back to their normal color. Be sure not to buff very hard, as it can damage your nails. Tooth whitening strips can be used as home remedies for nail discoloration. Cut the whitening strips into the pieces that will fit the shape and size of your nails. Place these pieces on your nails. Allow them to remain on your nails for at least ten minutes, and then rinse hands with warm water. Add some drops of lemon essential oil to a bowl of warm water and soak your fingers in it for at least ten minutes. Repeat this four times daily until your nails are clear.